What if you took your GoPro camera on a ride? Shoot your race using this handlebar mount and share your videos and sensations with your loved ones! Mount your GoPro camera inside your vehicle or on windows and other glass surfaces. The chest harness designed for GoPro Hero cameras, gives a new dimension to your sports films. Easily attach your GoPro camera to curved and flat surfaces with these adhesive mounts. 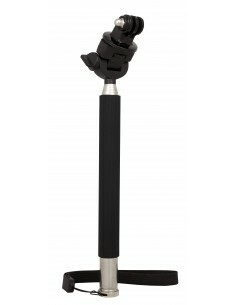 Telescopic Pole for GoPro Essential accessory for wider range videos. Shoot from above or from a distance, alone or in a group with a fantastic background.